Pioneer S-73A review | What Hi-Fi? Dolby Atmos has arrived. In the past few months we've reviewed a couple of Atmos-enabled AV receivers and now Blu-ray discs with Atmos soundtracks are beginning to appear. And now we have our first Atmos-equipped surround-sound speaker package in the form of the Pioneer S-73A. It consists of the S-FS73A floorstanders (£600 each), S-BS73A-LR standmounters (£600 per pair), and S-C73A centre channel (£350). The subwoofer originally designed to partner this package is not available in Europe. Instead, Pioneer sent us an equivalent existing model (the S-71W) - lowered from £500 to £350 - to bring the overall cost to £2500. Each component can be bought separately. At first glance, this looks like a regular 5.1 package. The mildly curved wood-fibre cabinets are armed with a mixture of woofers and concentric drivers. Each one of these is a 10cm aluminium midrange with a 25mm soft-dome tweeter at its centre. The aim is to deliver wide dispersion, a slim design and plenty of welly too. Draw your attention to the top of the speakers and you’ll see they are sloped. That’s where the Atmos drivers sit. They’re extra, upward-firing channels, which plug into the front-wide/front-height and surround-back connections of your amp. These speakers bounce effects off your ceiling so you’ll perceive them as overhead sounds. The idea is to add a whole new dimension to the sound and create an immersive, dome-shaped soundfield. It works. Those four extra drivers (which make this a 5.1.4 package) bring an element of verticality to your home cinema that simply isn’t there with a standard 5.1 package. It feels as if the ceiling is elevated – the sense of space is increased, and the soundfield is taller. Our test Blu-rays are a varied blend: official Dolby Atmos demos, BBC Earth’s Enchanted Kingdom documentary and, by way of contrast, Transformers: Age of Extinction. The demo clips offer plenty of effects designed purely to show off Atmos’s talents in the extreme. It’s hard not to be amused (and mildly alarmed) by the sensation of various noises buzzing and clicking around and over us. Effects placement is very precise. It is nothing new in the context of home cinema – until the noises running circles around you suddenly rise, going past your right ear and over your head. This is distinct from standard front-height channels, which really just raise the height of the sound in front of you, rather than traversing the room on top of you. Time for some real-world application, and we move to the nature documentary. It is a more sedate experience than that offered by an effects disc, naturally, as we track through a rainforest. Move away from the attention-grabbing demo effects, and it’s easy to see the real point of Atmos: realistic ambience. With noises coming from above, we are easily convinced of the canopy of foliage, insects and birds over our heads. The level of immersion and engagement increases: it’s a step from surveying to participating. We move on to the sensory overload that is Transformers 4 to mix ambience with heavy effects. That ceiling-free ambience is quite obvious. Off-screen helicopters hover nearby, while bullets and missiles fly over our heads with precision. Atmos works. We are very impressed by the level of immersion created by these speakers, which succeed in delivering extra scale, reach and precision. There are other elements to consider, however. Putting aside our affection for Atmos, we find ourselves disappointed with the package’s performance elsewhere. This is not a particularly detailed sound. It’s hard to follow and distinguish the individual strands of an orchestral score: what you get are broad, sweeping strokes but not the finer textures and subtleties. At one stage we can identify strings, but it isn’t clear what else is playing. The lack of clarity is another issue. We wouldn’t go so far as to call it muddy, but it’s not the most insightful sound we’ve heard. Neither voices nor effects feel particularly direct. Much of this is down to the lack of solidity and dynamics. We’d like a punchy, well-defined sound but here the Pioneer’s performance feels vague, a little soft at the edges, not to mention restrained. We can tell exactly where those bullets are, but there’s no sense of how hard they’re hitting. The treble is a little forward (and often bright), the midrange is recessed and in need of firming up, and the low-end feels overblown and tubby. The subwoofer in particular seems to struggle with definition. It’s an agile sound, which certainly helps with effects placement and panning, but it’s not enough to make for an exciting, engaging performance overall. In order to optimise your sound, it is crucial you set these speakers up properly. The floorstanders go in front and have adjustable spikes, which must be tightened. Upward-firing speakers ideally want to be angled correctly so that the sound bounces off the ceiling at the perfect angle to reach your listening position. The speakers’ fixed-angle Atmos drivers don’t allow for precise adjustment, so it’s worth moving the speakers around to find the optimal positions. Take care with connections, as AV receivers may have peculiar plug arrangements and it’s easy to use the wrong channel. Our Pioneer SC-LX88 preferred to assign the front Atmos channels to the surround-back plugs, for example. After plugging in, make sure you re-calibrate your AV receiver. Not only does this ensure you’ve got all the channels in the right places – it also allows Atmos to work with the desired precision. Is the Pioneer S-73A Dolby Atmos package worth its £2500 price tag? That depends on your priorities. There is no doubt that Atmos works wonders, and we can’t get enough of hearing sound come from above. 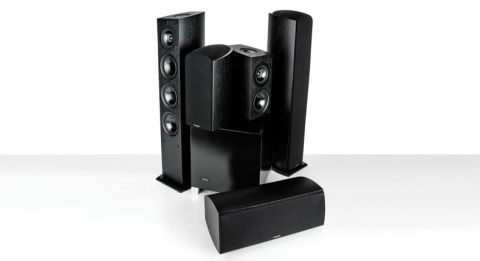 These speakers are certainly capable of granting you that extra dimension, and right now, they’re the only ones around. Credit to Pioneer for being the first to get consumer-ready Atmos speakers out there. But at what cost? We find ourselves disappointed with the quality of the sound in other ways. It’s not as clear, detailed, dynamic or punchy as we’d like for the money. That means you’re paying a lot for Atmos at a time when Atmos material is still quite thin on the ground. This is an excellent first step into the world of Atmos, but we need better sound and not just more of it. If Pioneer can add some deeper sonic quality to its Atmos tricks, we’d be all over it.